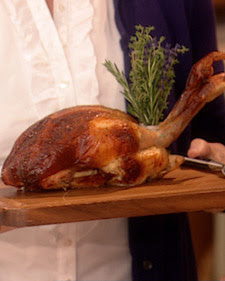 On a recent episode of Martha I learned a new way to make roast chicken from executive chef Daniel Humm. He works at the 4 star restaurant - Eleven Madison Park, in New York City. I am always interested and amazed to see how different chefs can take something seemingly ordinary - for example a chicken - and create something completely original and delicious. After all, how many ways can you cook a chicken? The answer is - it depends on the chef. Starting from the neck end of the chicken, carefully run your finger under the skin to separate from the meat, leaving it attached in the center to the sternum. Do not tear the skin. Evenly pipe stuffing under the skin of the legs and breasts. Season inside of chicken with salt; place rosemary and garlic in cavity of bird. Prick lemon all over with the tines of a fork and add to cavity. Truss chicken and transfer to a refrigerator to chill at least 3 hours and up to 24 hours. Preheat oven to 400 degrees. Place chicken in a roasting pan and transfer to oven. Roast chicken until juices run clear, about 1 hour. Remove from oven and loosely cover with parchment paper-lined aluminum foil. Let stand 30 minutes before carving and serving. Daniel Humm, Executive Chef A native of Switzerland, Daniel began his formal culinary training at the age of 14. 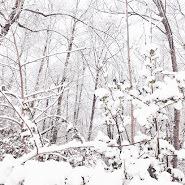 In his late teens, as Executive Chef of Gasthaus zum Gupf in the Swiss Alps, Daniel earned a Michelin Star. In 2003, Daniel moved to the United States as Executive Chef of Campton Place in San Francisco where he immediately received widespread attention, including Four Stars from The San Francisco Chronicle. Three years later, Daniel was selected Executive Chef of Eleven Madison Park. 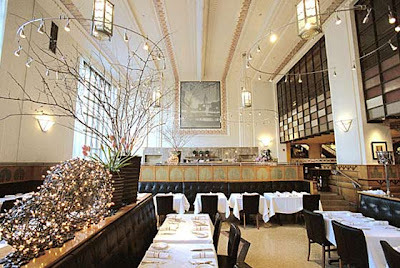 Under Daniel’s leadership, Eleven Madison Park was elevated to Three Stars from The New York Times in January 2007. In 2008, the restaurant won the James Beard Foundation Award for “Outstanding Wine Service,” and was designated Grand Chef Relais & Châteaux. 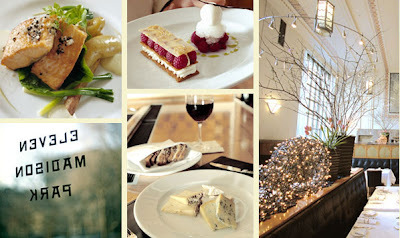 Most recently, Eleven Madison Park received its first ever Four Star review from The New York Times in August 2009. And I'm bringing my fork! I put the chicken in the frig a few hours ago to chill - the stuffing under-the-skin was a bit trickier than I thought but went fine for my first try. It smelled amazing! !